I think one of the things I've found strange in moving to a new culture is how you lose cultural cues you are used to. Back in November I couldn't believe it was my birthday because I hadn't seen people wearing poppies everywhere for the few weeks' prior. It was easier for Christmas because there were Christmas-y things around in the shops. Although, they were different cues than I'd had before and there were brand new traditions. Plus, I don't watch Czech TV so I didn't feel inundated with advertisements for Christmas gifts. And now it's Easter Monday and in a way I can't believe Easter is over. We celebrated at church of course; it was beautiful to celebrate the resurrection together. 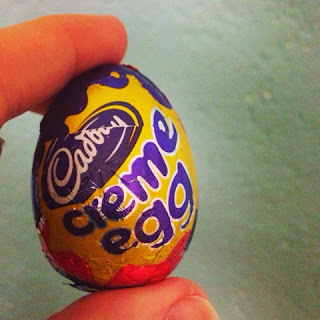 But never seeing a Creme Egg in a store (thankfully my parents brought me some so I have had two) or going to a dawn service just makes it feel strange. Of course, instead of the traditions I'm familiar with, there are new traditions to learn about. So, while there were no Creme Eggs Tesco did have whips to signify it was Easter. Why whips? Well, on Easter Monday here boys and men can go around and visit women and whip them. In return, the women give the men a painted egg or something to eat. You can read more about the tradition here. As I walked around my town this morning I did encounter men and boys with whips walking around. Thankfully I was not a target! I'm excited to continue to learn more about this new culture I live in and the new traditions. And hopefully as I learn about these cultural cues seasons will no longer shock me and take me by surprise!